National Chili Day happens to be the same day as National Margarita Day. 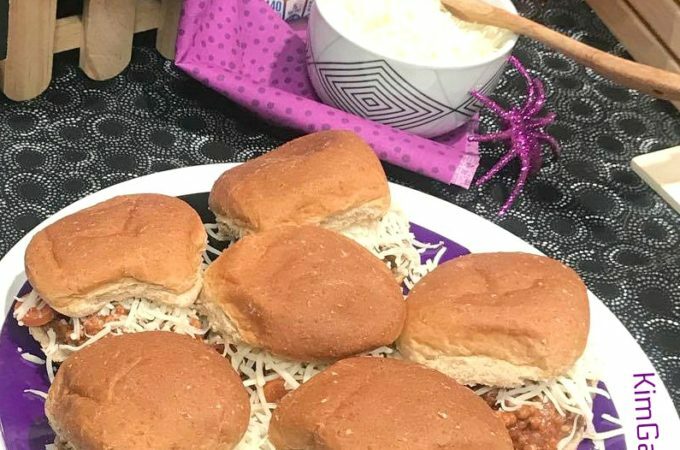 Both of these celebrations fall during Canned Foods Month. So I’m celebrating all of them with a batch of my easy stove-top chili, but not my traditional Big Beef Chili. 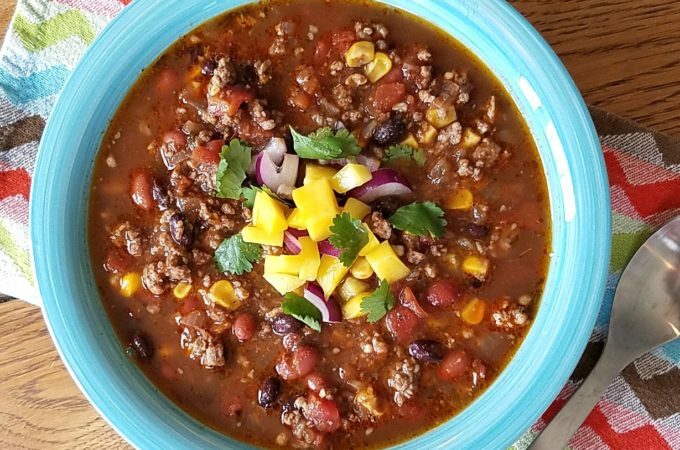 Today I’d like some warmth and tropical flair, so I’m doing my Caribbean-Spiced Chili with Beef and Pork. 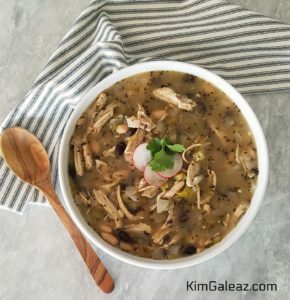 Or maybe my Black and White Chicken Chili. Both contain a variety of nutrient-rich canned foods, from canned broth and diced tomatoes, to diced green chilies and of course, lots of beans. 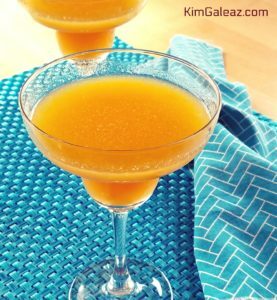 While that chili simmers, I’ll make Peach Margaritas in the blender. Easier than ever with canned peaches – which actually have more immune-boosting vitamin C than fresh peaches due to the canning process. Easy chili pork, beef and Caribbean spices. Heat oil in a very large stock pot or Dutch oven over medium heat. Add pork, beef, onions, garlic and habanero pepper. Cook until beef and pork are done, and stirring and breaking up pork and beef into small crumbles while cooking. Drain grease if desired, but Kim likes to keep it in for great flavor. Add all remaining ingredients through salt and stir well. Bring to a boil, then reduce heat to simmer. Simmer until flavors blend/meld about 25 minutes. Enjoy immediately with toppings. Refrigerate leftovers in tightly covered container and enjoy (or freeze) within 3 days. Makes about 14-15 cups chili. (8– 10 servings). Heat oil in a large stock pot or Dutch oven over medium heat. Add onion and sauté until just starting to soften, about 6 minutes. Add garlic and sauté another minute, until onions are completely done. Stir in both beans, green chilies, shredded chicken, chicken broth, cumin, oregano, cayenne, salt and pepper. Bring to a boil, then reduce heat to simmer. Simmer 20 to 30 minutes, then stir in lime juice. Enjoy with optional toppings. Refrigerate leftovers in tightly covered container and enjoy or freeze within 2 to 3 days. 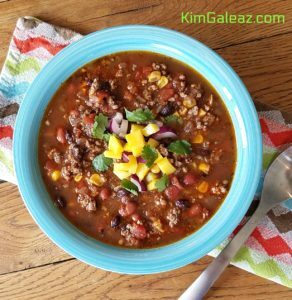 Makes about 12 cups chili (6-8 servings). Dip margarita glasses in sugar/salt mixture. Combine all ingredients in blender and puree until thoroughly mixed. Add in several tablespoons reserved peach liquid and more crushed ice if desired.